In our Podcaster Showcase series, we interview a podcaster who’s finding success with their show. We delve into how they started, how they’ve grown an audience and what they do to get a return on their efforts. The aim is to share experience and learn from anyone that’s making it work! 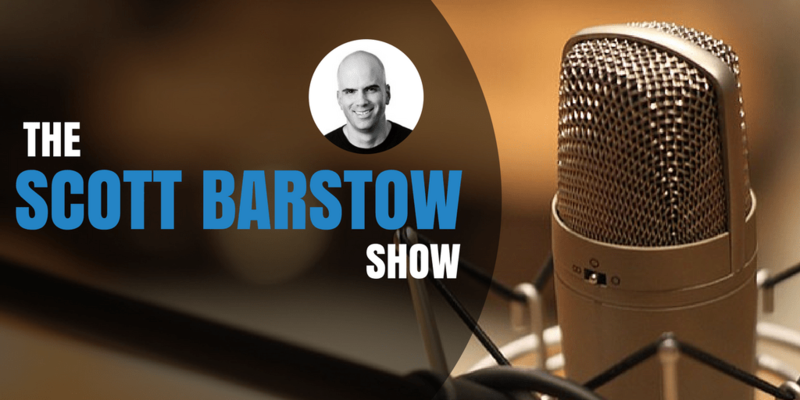 This week, we’re talking to Scott Barstow from The Scott Barstow Show. Give us a written trailer for your show. Why should we listen? I talk with founders of companies on the rise to find out why they’ve abandoned the corporate life to pursue building their own company. We talk about how they got their start, the challenges they’ve faced along the way, and what they’ve learned that we all need to know. Why did you decide to start the podcast? One of the best ways we all learn is by listening to those who’ve gone before us. I set out to talk to people I’ve met who are building great companies that you’ve probably never heard of to learn about what makes them tick. What equipment do you use to record? I used Skype call recorder and a RODE Podcaster mic for the first 28 shows. I then switched to using the RINGR app with the same mic. What’s your recording environment/setup usually like? I record out of my office in my home. Our Podcast Host Academy can help you launch, grow & make your show a success. Courses, live coaching, tools & community to help you nail your podcast this year. What is your usual editing process? I use Adobe Audition for all of my editing. I’ve a project template that has all of my intro and outro music and effects ready to go. I add the interview audio to the new project, edit as many of the noises and fillers out of the audio, then export it to MP3 and upload to Libsyn (use code podcraft for discount on signup!) for distribution. What are the top ways you’ve gained new audience members? I use my blog and social following to advertise the show episodes. I recently went on The App Guy podcast, and I also occasionally get writeups from local press. How do you get a return from your show, whether monetary or otherwise? I’ve intentionally to this point not reached out to sponsors of any kind. Instead, I’ve been fine-tuning the show and my approach over these first 30 episodes. I also don’t want to advertise for products I don’t believe in fully. It’s an area I spend a lot of time thinking about, as it feels like a loss of the show’s integrity to some extent. What unexpected benefit have you got from your show? I’ve learned things about people I thought I knew that were completely unexpected. People have been at times remarkably candid about the stress of building their company, their failures, and the cost of this choice on their lives. What one piece of advice do you have for a new podcaster in your industry? Don’t pay attention to the listener count. This is like old-fashioned war where the ground game is everything. You have to keep putting out quality content and not worry about this show’s download figures vs. last week or whatever. Listeners want to know you’re committed and that you can be counted on before they will commit to listening or talk about your show with others. You can listen to Scott Barstow on the The Scott Barstow Show and follow him here: @scottbarstow and LinkedIN. Colin has been teaching people how to podcast since 2007. He's worked with Universities, businesses and hobbyists alike. He started The Podcast Host to share his experience and to help as many people as possible get into Podcasting. He runs Podcraft, to spread the art of podcasting, and does the Mountain Bikes Apart podcast whenever he can. Who doesn't like to talk bikes, after all!